Can’t keep track of who’s suing who in “The Game of Smartphones”? This nifty image published by Forbes and found by The Big Picture blog ought to give you an idea of the war being waged. Why is this tangled web being woven in the courts of late? Here’s a hint: 2007. What does a year have to do with this mess? That’s the year Steve Jobs introduced the world to iOS and Apple’s iPhone(s aapl). That’s key because at the time, he said two things that directly impact the smartphone market of today. The iPhone has “Software that’s at least 5 years ahead of what’s on any other phone” is one quote from the iPhone launch, while “[B]oy, have we patented it.” is another. Fast forward to 2012, or exactly five years later, and we see that competing platforms and manufacturers have caught up in many ways. And as the different smartphones gain some semblance of parity, the battle shifts from product comparisons to product patents and protection. 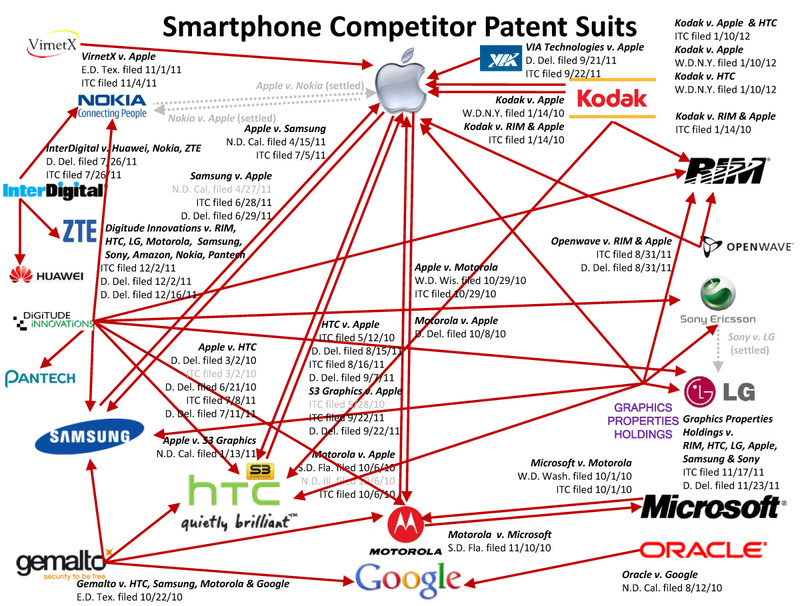 In my mobile predictions for 2012, I said the patent wars would get worse. Given that some of these suits started one or two years ago, it’s hard to define the situation now as “worse” or “better”, but the idea of patenting gestures and user interface elements still leaves plenty of room for the wars to continue. Thanks for sharing this…it looks like Digitude Innovations (self-described as an IP aggregator, licensor, and monetizer) is more likely a law firm with some very sharp and well financed teeth.